Cut sweet potatoes into 1/4″ cubes and dice onion into large chunks. 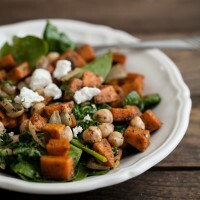 In a roasting dish, combine sweet potatoes, onions, greek yogurt, and Za’atar blend. Using spoons (or your hands), toss together until sweet potatoes are well coated. Roast until sweet potatoes are tender, 20-30 minutes. Squeeze lemon juice and drizzle olive oil on top. Toss together until well blended. Taste and add more lemon juice/olive oil if needed.